This article contains the top 10 best interview questions. These questions were carefully crafted to help you choose the best job candidate. They will also help you ensure the best candidate experience and make candidates choose your company as their Employer of choice. There are many numerous different interview questions you can ask your candidates in the job interview. So how can you choose the best ones? Ensure that the best candidate chooses you. Asking the right interview questions will help you choose the best job candidate - the one that perfectly matches your candidate persona. You can shortlist a few top candidates based on their resumes, but seeing them in person is the only way to choose the best one for your company. The same way you evaluate the candidate during your interview, the candidate also evaluates you. Keep in mind that the top talent always has the privilege to choose which company they want to work for. This is why you have to deliver an exceptional candidate experience if you want to win them over. 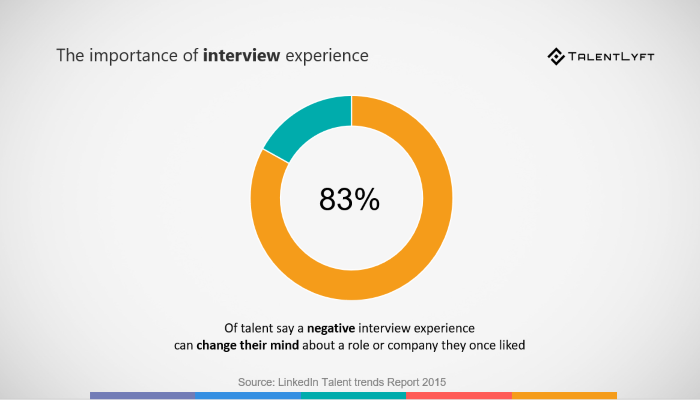 83% of talent says a negative interview experience can change their mind about a role or company they once liked. This is why it is extremely important to use interview questions that will not only help you choose the best fitting candidate but also showcase your Employer Brand. Question #1: What are the 3 most important things we need to know about you? This a great question to start the job interview with. It will show that you have already studied candidates’ resume. It will enable you to get a peek into how your candidates think. Which information from their resume will they highlight? Or will they tell you something new, that you can’t read in their resume? Question #2: What excites you most about this position? This a clever version of the standard “Why are you interested in this job?” question. By asking this question, you will gain a deeper understanding of your candidates' motivation and passion for the job position you are looking to fill. Skills can be taught, but there’s one thing that can’t be: enthusiasm about the job. Candidates who are truly excited about the job opportunity are significantly more likely to work harder and stay longer with your company. Question #3: What can you do better for us than the other applicants? Ask this question to make sure your candidates have a clear vision of a contribution they could add to your company, your industry and your business. Look for candidates who are confident and who can back up their success stories with clear and measurable results. This is especially important if you are looking for a candidate that will be proactive and focused on improving your current business processes by suggesting new ideas. Question #4: Name 3 things that you like the most about our company. Use this question to discern whether you are dealing with candidates that are simply looking for a job, or with candidates that have their heart set on your company. Asking this question will help you see how motivated your candidates are to work at your company specifically, instead of somewhere else. Try to find out what makes your company stand out from your competitors in their eyes. Make sure you choose candidates that also choose you as their Employer of choice to ensure high employee engagement and retention rates. Question #5: Why do you want to work at our company? Use this question to gain deeper insights on the reasons candidates are interested in working at your company, instead of somewhere else. This question will help you spot candidates who are attracted to your company because of authentic interest in your industry and company vision. Look for candidates who have a clear vision of how working at your company will advance their career and allow them to do the meaningful work they are fully committed to. Question #6: Describe the type of work environment in which you can really give your best and be most productive. Ask this question to find out what type of company culture are you candidates attracted to. After much time and money spent on finding high-quality candidates, you have to make sure that your rockstar candidate will fit in perfectly with your team and your company culture. Hiring the best talent by finding the perfect fit is the only way to ensure that you won’t end up disappointed with your rockstar candidate’s poor performance, early leave or termination. Question #7: What does your ideal work day look like? This is another important question that will help you estimate how well would you candidates fit into your company culture. What you want to find out is how do your candidates imagine a day at work that would make them feel enthusiastic? Once you have this idea of your candidates’ ideal work day, you can compare it with how an actual typical day at the job you need to fill looks like. The more similar these two are, the better the chance that the candidates will be more motivated and productive doing the job you offer. Question #8: How would you address (insert real-life, job-related problem)? This question is your best bet do evaluate your candidates’ skills, knowledge and experiences by seeing them in action. Of course that resume and then further candidate testing and assignments can provide some insights. However, only in person you can check how candidates think on their feet. Use a case of a relevant, real-life problem/crisis/situation they are really likely to encounter in the job position you are looking to fill. Question #9: Is there something that you would like to add that we haven’t asked you? This question serves as an invitation for candidates to mention anything relevant that you didn’t get a chance to cover. This question lets candidates walk away from your interview feeling more satisfied knowing they had a chance to give it their all. This is especially important for candidates that don’t end up being hired. Even if you reject them for this particular job position, they might be a great fit for some of your other current or future job positions, so you’ll want to keep them in your talent pool. Question #10: Do you have any questions for us? In my experience, this questions is one the most revealing questions you can ask. The way your candidates answer this question says a lot about their interest in the job. It will clearly show which candidates are thinking ahead about the job you are offering and your company. It will also let you in on the things your candidates are looking for and what is important for them. Need more great interview questions and tips? Are you looking for more great interview questions? Check out our article: Best Interview Questions to Ask Job Candidates. 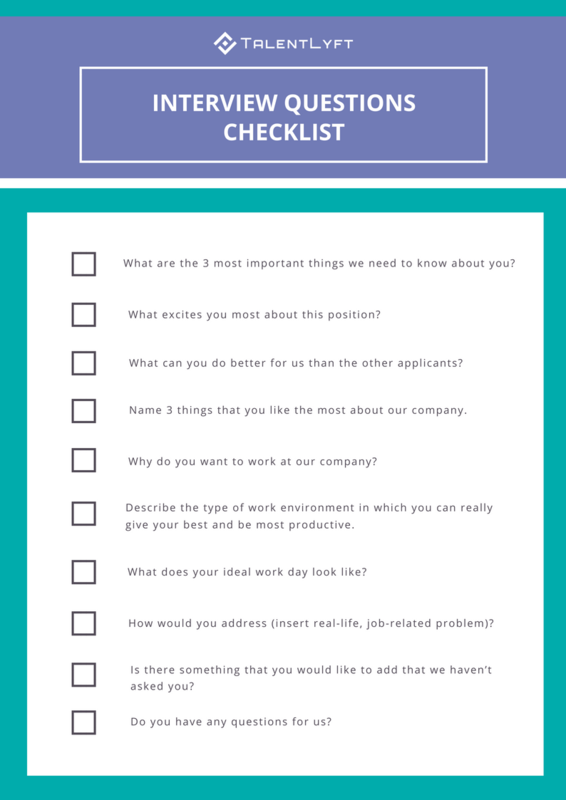 It provides a list of 55 interview questions divided into 11 categories that contain every question you’ll ever need to choose the best job candidate. Do you want to improve your job interviewing strategy? Download our Ebook: The Ultimate Guide for Conducting Job Interviews. In this EBook, you will learn how to define, plan and implement a successful strategy for performing job interviews. Are you struggling with interviewing recent graduates? Check out our article: How to Interview Recent Graduates - 6 Must Know Rules. Selecting recent graduates is challenging since you cannot rely on a job history or recommendations from previous employers. This article will reveal other effective methods that will help you see their potential. Take your interview process to a whole new level! Our TalentLyft Track solution can make your interviewing process much simpler and more organized. For starters, you could schedule every interview with just one click! You can also prepare your interview questions and score different candidates’ answers at the spot. Use our existing scorecards to evaluate your candidates, or create your own based on specific job interview questions.